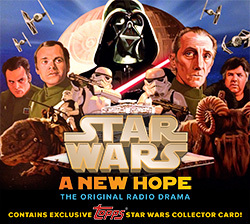 Hey, did you guys know about the Topps edition re-releases of the radio drama? And is that an aged Jimmy Smits as Bail Organa behind Leia? Hmmmm....interesting....You know, in the radio drama, Bail Organa plays a prominent role, so that makes sense. As for Declan Mulholland, my first thought when you pointed that out was, "What the heck???" But now that I think about it, it makes sense. The radio drama includes the Jabba scene, but makes a substantial alteration. I'm not sure why Brian Daley chose to put it this way, especially since the novel does have Jabba in that scene (IIRC), but in the radio drama, Han encounters "Heater", one of Jabba's top dogs. The conversation is largely the same, but Heater is a human, so I'm guessing Declan Mulholland is representing Heater rather than Jabba for the audio production. What happened to the Highbridge Audio site? They've disappeared…? If there isn't already a compiled list of differences between the broadcast and Highbridge editions, I might make one myself. It would take a bit of time to compile (I'd have to listen to each episode twice), but I'd be game to try if anybody might be interested. If there is such a list already, please direct me to it! Daley's solution was to keep the scene, but turn the Jabba character into somebody who could be more believably ambulatory. It's not as redundant as the scene in the movie because Greedo's dialogue in the radio program is in its original Rodese, so this scene works to cover the information that was conveyed by that scene in the film. * — Ridiculous, even. Thank goodness nobody would actually do such a thing. I've just finished listening to the radio drama, and I absolutely loved it -- which is kind of surprising, really, because I've always had a hard time listening and getting into audiobooks, which aren't too different from radio dramas (I guess the use of multiple actors with different voices makes all the difference *shrug*) . The only -- small -- problems I had with the drama were that some of the dialogue didn't sound all that natural (Leia's "my Alderaan" bit following the destruction of her homeworld is a perfectly hokey example) and that the actor who played Vader sounded too much like Frank Langella holding his nose. Anyway, I'm definitely going to give the TESB radio drama a listen after this. That art is ridiculous because Perry King is Han Solo not Harrison Ford. Ann Sachs is Leia. ^Seems like a silly quibble since everyone but Luke and 3PO were played by different actors. Obviously they are going for what people will already have in their heads rather than less familiar actors filling the roles. When I listen to Perry King's Han Solo, even though he sounds and acts very differently from Harrison Ford, I still picture Ford in my head. Are there any known differences between the broadcasts of ESB and the official audio releases? What appears to be a batch of off air reel to reel recordings has popped up on ebay. I wont quibble, but I would like to see a cover done up with the likeness's of the radio actors, just for novelties sake. I've just about reached the end of the internet and can't find any mention one way or another. I will say though (and this means nothing) the published script for the Star Wars NPR has scenes that are not on the my purchased CD set. Doesn't mean they were ever broadcast, but there were differences. Possible that Empire is the same. That said, it's also 2 hours shorter, so time may not have been an issue. Just on a whim, I finally tracked these down and am listening to them. The Last Jedi really reignited my interest in Star Wars. And I had to track down the Anchorhead thread since Anchorhead was always “the radio drama guy” to me. It’s so embedded in me now, I found it odd to read posts from an Anchorhead who was only just listening to them for the first time. But I’ve gotten through episode six of Star Wars, and I’m loving it so far! I suppose Brock Peters is really the only voice I’m having a hard time getting used to, but I’m hoping he’ll grow on me. I love Brock Peters, but I admit it’s easier to hear him as Ol’ Pa Sisko from Star Trek than as Darth Vader. But I loved that the first two episodes were entirely non-movie material (well, episode one being deleted scenes, but you know what I mean). I can’t wait to experience the movies in this new way, and I can’t believe it’s taken me this long! The Radio Drama is so wonderfully earnest and cheesy (in a good way! ), that I simply can’t find any fault in it at all. Do you guys know where can I get it? This is where I got mine. https://highbridgeaudio.com/starwars.html. Man, Gaffer, now I want to give it a listen again. 😉 I haven’t listened in about a year. I think C3PX put me onto those. At the time, I hadn’t heard them since their original airing. It was like I was hearing them for the first time. Still my favorite way to experience the original story. I ripped mine into iTunes several years ago so it’s on my work machine. Good way to start the year. I think C3PX put me onto those. Well, at least that’s what the beginning of the thread said. 😉 Is he still around at all? I just finished episode 8. I admit, from the larger “saga” perspective that I intentionally try to distance myself from when watching the first movie/novel/radio drama, there are a few things that are unintentionally amusing. And then, in episode 8, we get a much more in-depth look at Darth Vader torturing Leia and trying to manipulate her mind. At one point, he tries to convince her he’s Bail Organa. So you ultimately have Darth Vader, in an adaptation of the first movie, say to Princess Leia, “I’m your father! Tell your father what he wants to know!” I was howling! Just finished it. I absolutely loved it. It’s literally amazing. It definitely consolidated Star Wars as my favorite. Are the TESB and RotJ radio dramas just as good? I haven’t listened to the TESB adaptation, but I have the ROTJ. It isn’t as good. It’s pretty crummy by comparison, actually. Weird, I was just listen8ng to this Friday. Still love it. Haven’t heard any of the others. yes , It is strange for me as well as I was listening to The Empire Strikes Back Radio Drama on Friday ! I like it a lot though John Lithgow as Yoda is strange and takes some getting used to, also strange is that a very young David Allen Grier voices Boba Fett .It is shorter than the original radio drama but Mark Hamill , Billy Dee Williams and Anthony Daniels reprise their roles . The Jedi drama is ok but only Anthony Daniels is in it , it makes a lot of references to Shadows Of The Empire which I thought was cool .I also have the book of the Script which was published by Del Rey for The Empire Strikes Back in 1995 , it is illustrated throughout with Johnston and McQuarrie storyboards and some of the dialogue is different to the commercially released tapes and cd’s . There was an article I read on the differences somewhere , wish I could find it …would love to see it if anyone has it . 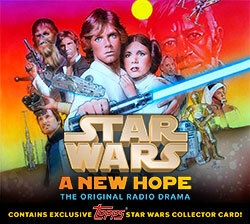 I absolutely love the radio dramas, and the A New Hope play is my single favorite piece of SW media. I wrote an essay about how the dramas affected me as a blind man and posted it in its own thread a while back. But since this seems to be the thread where all the radio drama info goes, I figured I’d post it here. If anyone has the scripts in electronic format, I’d really appreciate it if you could send them to me. I own the paperback copies, but haven’t had time to scan them and convert them to text so I can read them. I wish they were available as eBooks. I also wish the dramas themselves were on Spotify. People just aren’t buying CDs anymore and there’s no other way millennials will hear them. I also wish the dramas themselves were on Spotify. People just aren’t buying CDs anymore and there’s no other way millennials will hear them. This millennial found a way. Why? Why wouldn’t people listen to it the way they listen to podcasts?